When I first heard the theme of this month’s MxMo I was a bit worried. I didn’t know what I’d want to do – something classic, like the Manhattan or Sazerac, or maybe try to convert something out of the Harry Johnson’s bar guide that Marshall got me for my birthday? What the heck is Martell brandy anyways? Then I realized that MxMo in September would be on the 15th. If all is as it should be, I’ll be on my way back from NYC that day, and so on a very rainy day I decided that I would make some drinks and see what we can do. I started thumbing through Ted Haigh’s _Vintage Spirits & Forgotten Cocktails_ and found something that I thought looked really interesting. The recipe was a bit more complicated than I expected. Mix everything but the lemonade and the Curacao in an iced cocktail shaker. Strain into a bar glass. 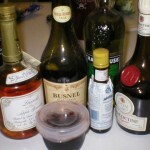 Add the Curacao to the bar glass. 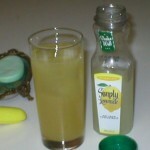 Pour the lemonade into a collins glass, then add the contents of the bar glass to the collins glass. Cathy might be sleeping so I didn’t want to be too noisy, and after all, my ice situation is usually fairly poor. 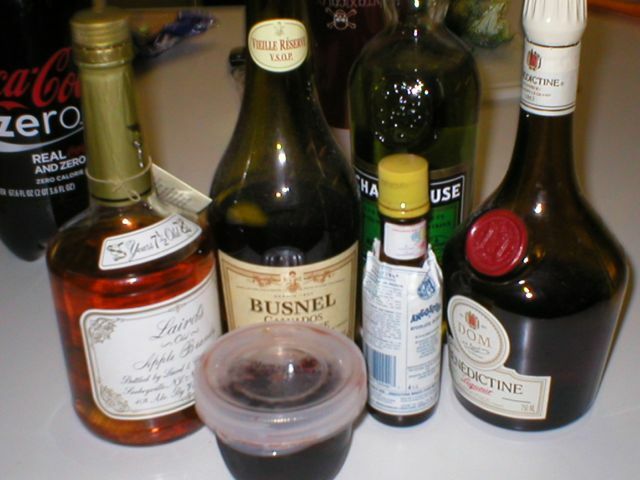 So I skipped the shaved ice and made up the drink – though at one point I poured the Curacao too early into a teaspoon, so I just drank it straight and re-poured it when I needed it. But, after all, it’s fall. 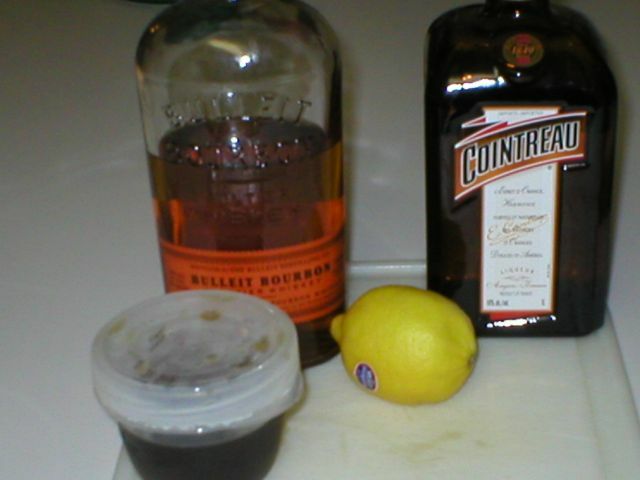 Bourbon is the traditional UVA drink during the fall, at least in my group of friends, and the three ways we often drank it was mixed with Coke, made into a bourbon sour, or made as a Lynchburg Lemonade by adding it straight to lemonade. This drink is nice. 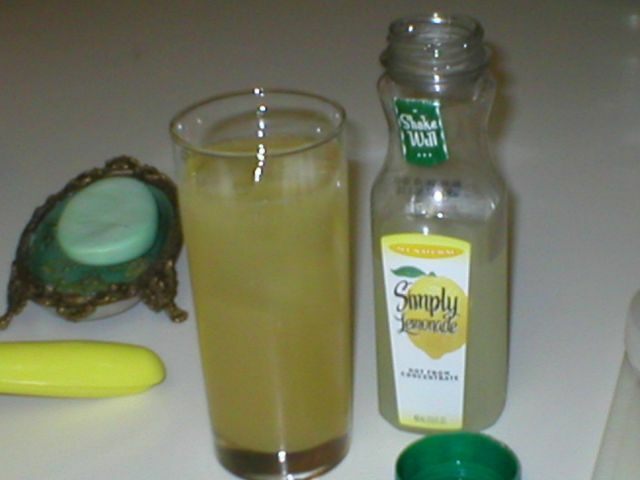 I’m wondering how much the preparation matters (other than the lemonade) and if you could add some club soda or even lemon-lime soda to make it a bit bubblier. But it’s going right on down and definitely making me feel better! The next drink I wanted to try is a Widow’s Kiss. I’ve seen the recipe a number of times but never made it, but moreso, it calls for green Chartreuse. I have a bottle of green, and all I’ve used it for is shots. When Marshall and I were out at a rather cool bar the Sunday night before Labor Day I was talking to the bartenders and pointed out that I’d never made a drink with Chartreuse in it. I just hadn’t gotten around to it. The Widow’s Kiss is noted to originally have called for green but yellow mellows it down. Screw yellow. I’m going green. If it worked in the first publication in 1895 it will work now. Shake and strain into a chilled cocktail glass. Garnish with a cherry. Dr. Cocktail is very adamant that you can NOT replace the Calvados with applejack. What I started wondering was whether or not you could replace it with the Laird’s 7 1/2 year old Apple Brandy or Clear Creek apple brandy. Well, if I said I didn’t have any Clear Creek around I’d be lying – more truthfully, I couldn’t be bothered to find it. 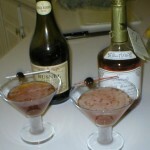 So, in the spirit of experimentation, I didn’t use applejack – but I did use the Laird’s Old Apple Brandy. I made them both at the same time. I don’t have a bright red maraschino cherry like Dr. 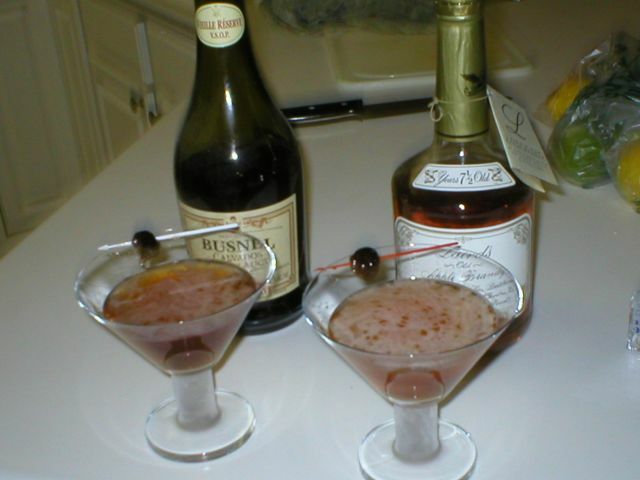 Cocktail uses in his picture, nor did I use yellow Chartreuse – so mine was darker and I just had a maraschino soaked sweet cherry above it. The Chartreuse was very evident in both of them, but the one with the Calvados was more balanced. With the Laird’s, the brandy floated into the background and just left green Chartreuse moderated only by a bit of Benedictine. Of the two drinks, the Fred Collins Fiz is definitely one I wouldn’t making on a regular basis and perhaps experimenting with more. This weekend, at the San Gerrano Feast in NYC, I had San Pelligrino Limonata and that might make for an interesting change to the drink. The Widow’s Kiss was good, but to me, it almost seemed more like a shooter of some sort. 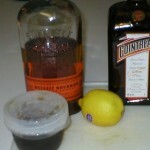 I’ll also have to try it with Yellow Chartreuse, either while visiting Marshall or after buying my own bottle finally. Harry Johnson, in the last recipe page of his bartender’s guide, has a similar recipe that’s 1/3rd each ingredient (using green Chartreuse) and the yolk of an egg, and I’m definitely going to make that sometime soon – I, of course, will let y’all know how that goes, especially as it seems like a layered drink. Until then – happy MxMo!